"Gromyko" redirects here. For other people named Gromyko, see Gromyko (surname). Andrei Andreyevich Gromyko (Russian: Андре́й Андре́евич Громы́ко; Belarusian: Андрэ́й Андрэ́евіч Грамы́ка; 18 July [O.S. 5 July] 1909 – 2 July 1989) was a Soviet Belarusian communist politician during the Cold War. He served as Minister of Foreign Affairs (1957–1985) and as Chairman of the Presidium of the Supreme Soviet (1985–1988). Gromyko was responsible for many top decisions on Soviet foreign policy until he retired in 1988. In the 1940s Western pundits called him Mr. Nyet ("Mr. No") or "Grim Grom", because of his frequent use of the Soviet veto in the United Nations Security Council. Gromyko's political career started in 1939 with his employment at the People's Commissariat for Foreign Affairs (renamed Ministry of Foreign Affairs in 1946). He became the Soviet ambassador to the United States in 1943, leaving in 1946 to become the Soviet Permanent Representative to the United Nations. Upon his return to the Soviet Union he became a Deputy Minister of Foreign Affairs and later the First Deputy Minister of Foreign Affairs. He went on to become the Soviet ambassador to the United Kingdom in 1952. During his tenure as Foreign Minister of the Soviet Union, Gromyko was directly involved in the Cuban Missile Crisis and helped broker a peace treaty ending the 1965 Indo-Pakistani War. Under Brezhnev's leadership, he played a central role in the establishment of detente with the United States through his negotiation of the ABM Treaty, the Nuclear Test Ban Treaty, and SALT I & II, among others. As Brezhnev's health declined during the latter years of his leadership, Gromyko formed a troika with KGB Chairman Yuri Andropov and Defense Minister Dmitriy Ustinov that increasingly dominated decision-making in Moscow. Henceforth, Gromyko's conservatism and hardline attitudes towards the West dictated the course of Soviet foreign policy until the rise of Mikhail Gorbachev in 1985. Following Gorbachev's election as General Secretary, Gromyko lost his office as foreign minister and was appointed to the largely ceremonial office of head of state. Subsequently, he retired from political life in 1988, and died the following year in Moscow. Gromyko was born to a poor "semi-peasant, semi-worker" Belarusian family in the Belarusian village of Staryya Gramyki, near Gomel on 18 July 1909. Gromyko's father, Andrei Matveyevich, worked as a seasonal worker in a local factory. Andrei Matveyevich was not a very educated man, having only attended four years of school, but knew how to read and write. He had fought in the Russo-Japanese War of 1904–1905. Gromyko's mother, Olga Yevgenyevna, came from a poor peasant family in the neighbouring city of Zhelezniki. She attended school only for a short period of time as, when her father died, she left to help her mother with the harvest. Gromyko grew up near the district town of Vetka where most of the inhabitants were devoted Old Believers in the Russian Orthodox Church. Gromyko's own village was also predominantly religious, but Gromyko started doubting the supernatural at a very early age. His first dialog on the subject was with his grandmother Marfa, who answered his inquiry about God with "Wait until you get older. Then you will understand all this much better". According to Gromyko, "Other adults said basically the same thing" when talking about religion. Gromyko's neighbour at the time, Mikhail Sjeljutov, was a freethinker and introduced Gromyko to new non-religious ideas and told Gromyko that scientists were beginning to doubt the existence of God. From the age of nine, after the Bolshevik revolution, Gromyko started reading atheist propaganda in flyers and pamphlets. At the age of thirteen Gromyko became a member of the Komsomol and held anti-religious speeches in the village with his friends as well as promoting Communist values. The news that Germany had attacked the Russian Empire in August 1914 came without warning to the local population. This was the first time, as Gromyko notes, that he felt "love for his country". His father, Andrei Matveyevich, was again conscripted into the Imperial Russian Army and would serve for three years on the southwestern front, under the leadership of General Aleksei Brusilov. Andrei Matveyevich returned home on the eve of the 1917 October Revolution in Russia. Gromyko was elected First Secretary of the local Komsomol chapter at the beginning of 1923. Following Vladimir Lenin's death in 1924, the villagers asked Gromyko what would happen in the leader's absence. Gromyko remembered a communist slogan from the heyday of the October Revolution: "The revolution was carried through by Lenin and his helpers." He then told the villagers that Lenin was dead but "his aides, the Party, still lived on." When he was young Gromyko's mother Olga told him that he should leave his home town to become an educated man. Gromyko followed his mother's advice and, after finishing seven years of primary school and vocational education in Gomel, he moved to Borisov to attend technical school. Gromyko became a member of the All-Union Communist Party Bolsheviks in 1931, something he had dreamed of since he learned about the "difference between a poor farmer and a landowner, a worker and a capitalist". Gromyko was voted in as secretary of his party cell at his first party conference and would use most of his weekends doing volunteer work. Gromyko received a very small stipend to live on, but still had a strong nostalgia for the days when he worked as a volunteer. It was about this time that Gromyko met his future wife, Lydia Dmitrievna Grinevich. Grinevich was the daughter of a Belarusian peasant family and came from Kamenki, a small village to the west of Minsk. She and Gromyko would have two children, Anatoly and Emilia. We were amazed to find ourselves treated as equals and placed at their table to enjoy what for us was a sumptuous feast. We realised then that not for nothing did the Soviet state treat its scientists well: evidently science and those who worked in it were highly regarded by the state. After that day of pleasantry, Gromyko for the first time in his life wanted to enter higher education, but without warning, Gromyko and his family were moved in 1934 to Moscow, settling in the northeastern Alexeyevsky District. In 1936, after another three years of studying economics, Gromyko became a researcher and lecturer at the Soviet Academy of Sciences. His area of expertise was the US economy, and he published several books on the subject. Gromyko assumed his new job would be a permanent one, but in 1939 he was called upon by a Central Committee Commission which selected new personnel to work in diplomacy. (The Great Purge of 1938 opened many positions in the diplomatic corps.) Gromyko recognised such familiar faces as Vyacheslav Molotov and Georgy Malenkov. A couple of days later he was transferred from the Academy of Sciences to the diplomatic service. In early 1939, Gromyko started working for the People's Commissariat for Foreign Affairs in Moscow. Gromyko became the Head of the Department of Americas and because of his position Gromyko met with United States ambassador to the Soviet Union Lawrence Steinhardt. Gromyko believed Steinhardt to be "totally uninterested in creating good relations between the US and the USSR" and that Steinhardt's predecessor Joseph Davies was more "colourful" and seemed "genuinely interested" in improving the relations between the two countries. Davies received the Order of Lenin for his work in trying to improve diplomatic relations between the US and the USSR. After heading the Americas department for 6 months, Gromyko was called upon by Joseph Stalin. Stalin started the conversation by telling Gromyko that he would be sent to the Soviet embassy in the United States to become second-in-command. "The Soviet Union," Stalin said, "should maintain reasonable relations with such a powerful country like the United States, especially in light of the growing fascist threat". Vyacheslav Molotov contributed with some minor modifications but mostly agreed with what Stalin had said. "How are your English skills improving?," Stalin asked, "Comrade Gromyko you should pay a visit or two to an American church and listen to their sermons. Priests usually speak correct English with good accents. Do you know that the Russian revolutionaries when they were abroad, always followed this practice to improve their skills in foreign languages?" Gromyko was quite amazed about what Stalin had just told him but he never visited an American church. Gromyko had never been abroad before and, to get to the United States, he had to travel via airplane through Romania, Bulgaria and Yugoslavia to Genoa, Italy, where they boarded a ship to the United States. He later wrote in his Memoirs that New York City was a good example on how humans, by the "means of wealth and technology are able to create something that is totally alien to our nature". He further noticed the New York working districts which, in his own opinion, were proof of the inhumanity of capitalism and of the system's greed. Gromyko met and consulted with most of the senior officers of the United States government during his first days and succeeded Maxim Litvinov as ambassador to the United States in 1943. In his Memoirs Gromyko wrote fondly of President Franklin D. Roosevelt even though he believed him to be a representative of the bourgeoisie class. During his time as ambassador, Gromyko met prominent personalities such as British actor Charlie Chaplin, American actress Marilyn Monroe and British economist John Maynard Keynes. Gromyko was a Soviet delegate to the Tehran, Dumbarton Oaks, Yalta and Potsdam conferences. In 1943, the same year as the Tehran Conference, the USSR established diplomatic relations with Cuba and Gromyko was appointed the Soviet ambassador to Havana. Gromyko claimed that the accusations brought against Roosevelt by American right-wingers, that he was a socialist sympathizer, were absurd. While he started out as a member delegate Gromyko later became the head of the Soviet delegation to the San Francisco conference after Molotov's departure. When he later returned to Moscow to celebrate the Soviet victory in the Great Patriotic War, Stalin commended him saying a good diplomat was "worth two or three armies at the front". Gromyko was appointed Permanent Representative of the Soviet Union to the United Nations (UN) in April 1946. The USSR supported the election of the first Secretary-General of the United Nations, Trygve Lie, a former Norwegian Minister of Foreign Affairs. However, in the opinion of Gromyko, Lie became an active supporter of the "expansionist behaviour" of the United States and its "American aggressionist" policy. Because of this political stance, Gromyko believed Lie to be a poor Secretary-General. Trygve's successor, Swede Dag Hammarskjöld also promoted what Gromyko saw as "anti-Soviet policies". U Thant, the third Secretary-General, once told Gromyko that it was close to impossible to have an objective opinion of the USSR in the Secretariat of the United Nations because the majority of secretariat members were of American ethnicity or supporters of the United States. Gromyko often used the Soviet veto power in the early days of the United Nations. So familiar was a Soviet veto in the early days of the UN that Gromyko became known as Mr Nyet, literally meaning "Mr No". During the first 10 years of the UN, the Soviet Union used its veto 79 times. In the same period, the Republic of China used the veto once, France twice and the others not at all. On May 14, 1947, Gromyko advocated the one-state solution to the Israeli–Palestinian conflict, and the two-state solution as the second best option in the case that "relations between the Jewish and Arab populations of Palestine... proved to be so bad that it would be impossible to reconcile them". Gromyko was appointed Soviet ambassador to the United Kingdom at a June 1952 meeting with Joseph Stalin in the Kremlin. Stalin paced back and forth as normal, telling Gromyko about the importance of his new office, and saying "The United Kingdom now has the opportunity to play a greater role in international politics. But it is not clear in which direction the British government with their great diplomatic experience will steer their efforts [...] This is why we need people who understand their way of thinking". Gromyko met with Winston Churchill in 1952 not to talk about current politics but nostalgically about World War II. Gromyko met Churchill again in 1953 to talk about their experiences during World War II before returning to Russia when he was appointed Deputy Minister of Foreign Affairs. Andrei Gromyko spent his initial days as Minister of Foreign Affairs solving problems between his ministry and the International Department (ID) of the Communist Party of the Soviet Union (CPSU) headed by Boris Ponomarev. Ponomarev advocated an expanded role for the ID in Soviet foreign relations; Gromyko flatly refused it. Valentin Falin, a top Soviet official, said the ID "interfered in the activities" of Gromyko and his ministry countless times. Gromyko disliked both Ponomarev and the power sharing between the ID and the foreign ministry. In 1958 Mao Zedong tried to look for supporters within the Soviet leadership for his planned war with the Republic of China (Taiwan). He flabbergasted Gromyko by telling him that he was willing to sacrifice the lives of "300 million people" just for the sake of annexing the Republic of China into the People's Republic of China. Gromyko assured Mao that the proposal would never get the approval of the Soviet leadership. When the Soviet leadership learnt of this discussion they responded by terminating the Soviet-Chinese nuclear program and various industrialization projects in the People's Republic of China. Years later during the Cuban Missile Crisis, Gromyko met John F. Kennedy, then President of the United States, while acting on the instruction of the Soviet leadership under Nikita Khrushchev. In his Memoirs, Gromyko wrote that Kennedy seemed out of touch when he first met him, and was more ideologically driven than practical. In a 1988 interview, he further described Kennedy as nervous and prone to making contradictory statements involving American intentions towards Cuba. During his twenty-eight years as Minister of Foreign Affairs Gromyko supported the policy of disarmament, stating in his Memoirs that "Disarmament is the ideal of Socialism". 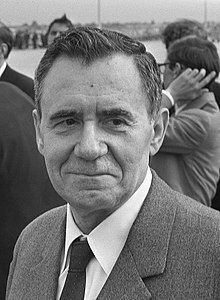 Throughout his career as Soviet Foreign Minister, Gromyko explicitly promoted the idea that no important international agreement could be reached without the Soviet Union's involvement. One accomplishment he took particular pride in was the signing of the 1963 Partial Test Ban Treaty whose negotiation could be traced back to 1958. Additionally, in 1966, Gromyko and Alexei Kosygin persuaded both Pakistan and India to sign the Tashkent Declaration, a peace treaty in the aftermath of the Indo-Pakistan war of 1965. Later in the same year, he engaged in a dialog with Pope Paul VI, as part of the pontiff's ostpolitik that resulted in greater openness for the Roman Catholic Church in Eastern Europe although there was still heavy persecution of Christians in the Soviet Union. Gromyko also prided himself on the signing of the Treaty on the Non-Proliferation of Nuclear Weapons on 1 July 1968, the 1972 ABM and SALT I treaties, and the Agreement on the Prevention of Nuclear War in 1973. After joining the Politburo in 1973 during Leonid Brezhnev's rule, Gromyko gradually assumed control over the Soviet Union's foreign policy. Upon reaching the peak of his power and influence, Gromyko's approach to diplomacy suffered due to the very same qualities that underpinned his early career. His exceptional memory and confidence in his experience now made him inflexible, unimaginative and devoid of a long-term vision for his country. By the time Andropov and Chernenko rose to the Soviet leadership, Gromyko frequently found himself advocating a harder line than his superiors. As Brezhnev grew increasingly incapable of governing following a stroke in 1975, Gromyko formed a troika with KGB Chairman Yuri Andropov and Defense Minister Dmitry Ustinov that ultimately became the driving force behind Soviet policymaking. After Brezhnev's death in 1982, Andropov was voted in as General Secretary by the Politburo. Immediately after his appointment Andropov asked Gromyko if he wanted to take over Brezhnev's old office of the Chairman of the Presidium of the Supreme Soviet. Gromyko turned down Andropov's offer, believing that Andropov would eventually take the office for himself. He did not believe that Andropov would take the office because of pure vanity, but rather due to its functions. After Chernenko's death in 1985, Gromyko nominated Mikhail Gorbachev for the General Secretaryship on 11 March 1985. In supporting Gorbachev, Gromyko knew that the influence he carried would be strong. After being voted in Gorbachev relieved Gromyko of his duty as foreign minister and replaced him with Eduard Shevardnadze and Gromyko was appointed to the largely honorary position of Chairman of the Presidium of the Supreme Soviet. Gromyko held the office of the Chairman of the Presidium of the Supreme Soviet, literally head of state, which was largely ceremonial, and his influence in ruling circles diminished. A number of First World journalists believed Gromyko was uncomfortable with many of Gorbachev's reforms, however, in his Memoirs Gromyko writes fondly of Gorbachev and the policy of perestroika. Gromyko believed that perestroika was about working for the construction of a socialist society and saw glasnost and perestroika as an attempt at making the USSR more democratic. Such moments in life are just as memorable as when one is appointed to prominent positions. When my comrades took farewell to me, I was equally moved as I had ever been when I was given an important office. What I thought most about was that I had finished my duties towards the people, the Party and the state. This memory is very precious to me. Gorbachev succeeded Gromyko in office as Chairman of the Presidium of the Supreme Soviet. After his resignation Gorbachev praised Gromyko for his half-century of service to USSR. Critics, such as Alexander Belonogov the Permanent Representative of the Soviet Union to the United Nations, claimed Gromyko's foreign policy was permeated with "a spirit of intolerance and confrontation". After retiring from active politics in 1989 Gromyko started working on his memoirs. Gromyko died on 2 July 1989, days before what would have been his 80th birthday, after being hospitalised for a vascular problem that was not further identified. His death was followed by a minute of silence at the Congress of People's Deputies to commemorate him. The Telegraph Agency of the Soviet Union (TASS), the central news organ in the USSR, called him one of the country's most "prominent leaders". President of the United States George H. W. Bush sent his condolences to Gromyko's son, Anatoly. Gromyko was offered a grave in the Kremlin Wall Necropolis, but at the request of his family he was not buried near the Kremlin wall but instead at the Novodevichy cemetery. Having been a person of considerable stature during his life Gromyko held an unusual combination of personal characteristics. Some were impressed by his diplomatic skills, while others called Gromyko mundane and boring. An article written in 1981 in The Times said, "He is one of the most active and efficient members of the Soviet leadership. A man with an excellent memory, a keen intellect and extraordinary endurance [...] Maybe Andrey is the most informed Minister for Foreign affairs in the world". Gromyko's dour demeanour was shown clearly during his first term in Washington and echoed throughout his tenure as Soviet foreign minister. Ambassador Charles W. Yost, who worked with Gromyko at the Dumbarton Oaks Conference, the UN founding conference, and at the United Nations, recalled that the "humorless" Soviet ambassador "looked as though he was sucking a lemon." There is a story that Gromyko was leaving a Washington hotel one morning and was asked by a reporter; "Minister Gromyko, did you enjoy your breakfast today?" His response was "Perhaps." He has concealed a veritable treasure-trove from future generations and taken to the grave with him an inestimable knowledge of international connection between the historical events and major figures of his time, which only he could offer. What a pity that this very man proved incapable to the very end of evoking his experience. As a faithful servant of the state, he believed that he should restrict himself to a sober, concise presentation of the bare essentials. On 18 July 2009, Belarus marked the 100th anniversary of Gromyko's birth with nationwide celebrations. In the city of his birth many people laid flowers in front of his bust. A ceremony was held attended by his son and daughter, Anatoly and Emiliya. Several exhibitions were opened and dedicated to his honour and a school and a street in Gomel were renamed in honour of him. ^ Соседи по парте (in Russian). RPP. Retrieved 11 September 2010. ^ Ethnic Groups of Europe: An Encyclopedia. ABC-CLIO. 2011. p. 46. ISBN 9781598843026. ^ Gromyko 1989, p. 13. ^ Gromyko 1989, p. 14. ^ Gromyko 1989, p. 12. ^ Gromyko 1989, p. 17. ^ Gromyko 1989, p. 18. ^ Gromyko 1989, p. 19. ^ Gromyko 1989, p. 21. ^ Gromyko 1989, p. 24. ^ a b Gromyko 1989, p. 25. ^ Gromyko 1989, p. 15. ^ Gromyko 1989, p. 26. ^ Gromyko 1989, p. 27. ^ Gromyko 1989, p. 28. ^ Gromyko 1989, p. 29. ^ a b Gromyko 1989, p. 30. ^ Gromyko 1989, p. 33. ^ Gromyko 1989, p. 35. ^ Gromyko 1989, pp. 36–7. ^ Gromyko 1989, p. 39. ^ Gromyko 1989, p. 40. ^ Gromyko 1989, p. 41. ^ Gromyko 1989, p. 42. ^ Gromyko 1989, p. 43. ^ Gromyko 1989, pp. 48–9. ^ Gromyko 1989, p. 50. ^ Gromyko 1989, p. 73. ^ Gromyko 1989, p. 77. ^ Gromyko 1989, p. 82. ^ Gromyko 1989, p. 88. ^ Gromyko 1989, p. 89. ^ Gromyko 1989, p. 95. ^ Gromyko 1989, p. 103. ^ Gromyko 1989, p. 144. ^ Gromyko 1989, p. 141. ^ Gromyko 1989, p. 142. ^ Gromyko 1989, p. 143. ^ Karfala, Tarik (17 September 2003). "The veto and how to use it". BBC Online. Retrieved 18 November 2010. ^ "Discussion of the report of the First Committee on the establishment of a special committee on Palestine". United Nations General Assembly. 14 May 1947. A/2/PV.77. Retrieved 28 August 2017. ^ Gromyko 1989, p. 162. ^ Zeigler, Charles E. (2009). The History of Russia. ABC-CLIO. p. 103. ISBN 0-313-36307-2. ^ Cooper, Helene (1988). "Interview with Andrei Gromyko, 1988". Open Vault WGBH Archives. Archived from the original on 13 July 2012. Retrieved 11 September 2010. ^ Zeigler, Charles E. (2009). The History of Russia. ABC-CLIO. p. 110. ISBN 0-313-36307-2. ^ O'Sullivan, John (2009). The President, the Pope, and the Prime Minister: Three Who Changed the World. Regnery Publishing. pp. 94–5. ISBN 1-59698-016-8. ^ Pospielovsky, Dimitry V. (1988). A History of Soviet Atheism in Theory and Practice, and the Believer, vol 2: Soviet Anti-Religious Campaigns and Persecutions. 2. St Martin's Press. p. 160. ISBN 1-59698-016-8. ^ McCauley, Martin (2002). Who's who in Russia since 1900. Routledge. p. 100. ISBN 0-415-13898-1. ^ a b Schmidt-Häuer, Christian (1986). Gorbachev: The Path to Power. I.B.Tauris. p. 107. ISBN 978-1-85043-015-5. ^ Figes 2014, p. 266. ^ Tikhonov, Dmitry. Андрей Андреевич Громыко (in Russian). people.ru. Archived from the original on 11 October 2010. Retrieved 11 September 2010. ^ O'Sullivan, John (2009). The President, the Pope, and the Prime Minister: Three Who Changed the World. Regnery Publishing. p. 223. ISBN 1-59698-016-8. ^ Elliott & Lewin 2005, p. 238. ^ "Gorbachev takes reform plans to party plenum". Pittsburgh Post-Gazette. 25 June 1987. Retrieved 12 September 2010. ^ Gromyko 1989, p. 70. ^ Gromyko 1989, p. 265. ^ "Gromyko resignation urged at conference". Manile Standard. 2 July 1988. Retrieved 12 September 2010. ^ "President Gromyko called on to resign". The Glasgow Herald. 1 July 1988. Retrieved 12 September 2010. ^ Gromyko 1989, p. 8. ^ McManus, Doyle (4 October 1988). "Demoted Politburo 'more equal'". The Sydney Morning Herald. Retrieved 12 September 2010. ^ Parks, Michael (3 October 1988). "Soviet official critical of Gromyko in party newspaper". Los Angeles Times. Retrieved 12 September 2010. ^ a b c Громыко Андрей Андреевич (in Russian). hrono.ru. Archived from the original on 20 September 2010. Retrieved 8 October 2010. ^ Elliott & Lewin 2005, p. 236. ^ Yost, Charles W. (1980). History and Memory. Norton. p. 116. ^ "Postcard from Budapest". BBC Online. 10 December 2002. Retrieved 12 September 2010. ^ Elliott & Lewin 2005, pp. 236–37. ^ a b Elliott & Lewin 2005, p. 237. ^ Elliott & Lewin 2005, pp. 237–38. ^ Беларусь отмечает 100-летие со дня рождения Андрея Громыко – дипломата с мировым именем (in Russian). Obshchenatsional'noe Televidenie. 18 July 2009. Retrieved 11 September 2010. ^ "Andrey Gromyko". Land of Ancestors. Retrieved 30 November 2012. Coleman, Fred (1996). The Decline and Fall of the Soviet Empire: Forty Years That Shook The World. St. Martin's Press, Macmillan Publishers. ISBN 0-312-16816-0. Elliott, Gregory; Lewin, Moshe (2005). The Soviet Century. Verso Books. ISBN 1-84467-016-3. Figes, Orlando (2014). Revolutionary Russia, 1891-1991: A History. Metropolitan Books, Henry Holt & Company. ISBN 978-0-8050-9131-1. Gromyko, Andrei (1989). Memoirs. Doubleday. ISBN 0-385-41288-6. Wikimedia Commons has media related to Andrei Gromyko. The Overseas Expansion of Capital: Past and Present by Andrei Gromyko, 1985. This page was last edited on 14 April 2019, at 04:35 (UTC).